It feels wrong to write “crêpes” without an exclamation mark. Because when you have grown up in France, crêpes invariably elicit a tingling sensation of fleeting but irrepressible excitement. Crêpes were the rare summer treat sold in the van by the beach after a long hot hazy day. They were, on occasion, devoured at a boisterous restaurant with sticky tables and wooden benches. And, sometimes, crêpes were made at home. And, most probably, one of those times was February 2nd. Today is La Chandeleur (Candlemas), which is technically a Christian festival that celebrates the Presentation of Jesus at the Temple, but to most French men, women, and children, it is just “Crêpes Day” (Crêpes! Day). Every year we celebrate La Chandeleur, and if for me the thrill of crêpes may have abated somewhat, my children need those memories, too. Usually February comes so fast that I end up haphazardly making a batch of crêpes from a random recipe found online, or a very distant recollection of 12 eggs, 1 kilo flour, 1 liter milk, and some beer. Melt the butter and remove from the heat. In a large bowl, mix the flour with the sugar and salt and make a well in the mixture. Add the eggs, one at a time, stirring them into the flour with circular movements. Pour in the milk little by little, whisking continuously to obtain a smooth batter. Add melted butter, vanilla, rum, lemon zest, and stir well. Cover and place in the refrigerator for at least 1 hour and up to 2 days. To cook the crêpes: Heat a non-stick skillet until it is piping hot (a drop of batter poured onto the pan should sizzle) then lower the heat to medium. Grease the skillet with a paper towel dabbed with clarified butter or coconut oil (there should only be a faint layer of fat in the pan). Holding the skillet in one hand, pour a ladle of batter with the other, turning the skillet quickly in a round motion to cover the base with a thin and even layer of batter (if there is too much batter, pour it back into the bowl, if there isn’t enough, quickly add a little). As soon as the surface of the crêpe is dry (barely a minute or two depending on the heat), lift it with a spatula and turn it around (or flip the crêpe by tossing it, if you feel so inclined). Barely another minute and the crêpe is ready. Repeat, stirring the batter lightly with the ladle from the bottom up between each crêpe. The best way to keep crêpes warm is to place them on a plate over a pan of simmering water, covered with another large plate or lid. They will not dry out that way. Garnish with the filling of choice and roll or fold the crepes to eat! *Madame E. Saint-Ange suggests using clarified butter, which is a great idea since without the milk solids, the butter doesn’t burn. To clarify butter, melt in a small saucepan and continue to cook until the milk solids have risen to the surface and attached at the bottom. Skim off top layer and pour the clear butter without the solids into a clean bowl. Keeps well covered in the refrigerator. This entry was posted on 2 February 2011 at 22:17 and is filed under Dessert, Fall, Spring, Summer, Winter, Year-round. You can follow any responses to this entry through the RSS 2.0 feed. You can skip to the end and leave a response. Pinging is currently not allowed. Oh la la je suis desolee je ne pourrais pas vous le dire comme ca mais je compterais la prochaine fois que j’en ferais. En tout cas 1 kilo ca fait beaucoup, surtout si elles sont tres fines! I can’t wait to try these! I had no idea Feb. 2nd was Crepes Day! how very timely – just yesterday i bought myself a crêpe from a stand, as i had such a craving for it… but making them at home seems a much better idea! “butterschmalz” can be used as clarified butter, no? Crêpes are clearly in the air – consciously or subconsciously! Butterschmalz is clarified butter (as I’ve just learned – thanks!). Of course using regular butter works, too, but I try to avoid using it if it is going to burn. 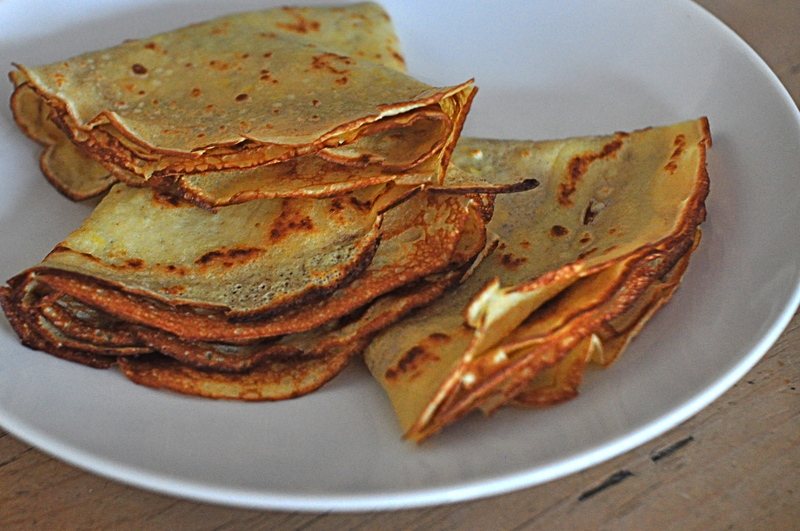 crêpes – “dulce de leche” at home! Ça m’intéresse – autant la recette que le raccourci, à moins que ce ne soit un secret de famille? Sur Pa[u] un jour peut-être?